FMC™ 200 Product Information | Smooth-On, Inc.
FMC™-200 is a polysulfide rubber mold compound with high tear strength that cures overnight with negligible shrinkage. Molds made of FMC™-200 are very durable and will perform in production. The mix ratio is 100 parts of Part A to 12 parts of Part B by weight. FMC™-200 cures to a Shore hardness of 20 A.
FMC™-200 is ideal for those applications that require capturing intricate detail from a variety of model surfaces. 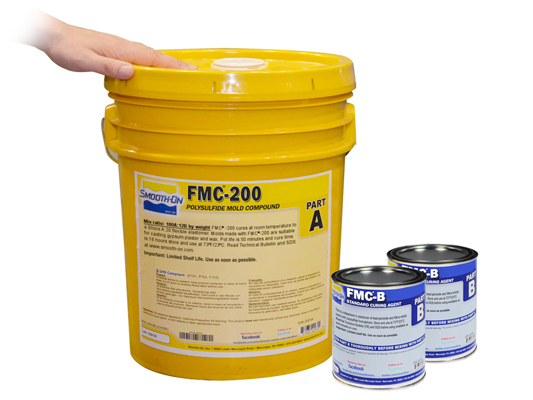 Unlike polyurethanes, FMC™-200 is not sensitive to moisture and can be poured directly over wet plaster or water/sulfur based clays. Common applications include molds for foundry and pattern work, sculpture (lost wax process), casting various gypsum products and waxes. MEASURING AND MIXING - YOU MUST STIR PARTS A AND B THOROUGHLY BEFORE YOU BEGIN. Materials should be stored and used in a warm environment (72°F / 22°C). This product has a limited shelf life and should be used as soon as possible. Mixing should be done in a well ventilated area. Wear safety glasses, long sleeves and rubber gloves to minimize contamination risk. After mixing Part B, pour the desired amount (as measured by weight) into a clean container. Add the appropriate amount of Part A by weight. 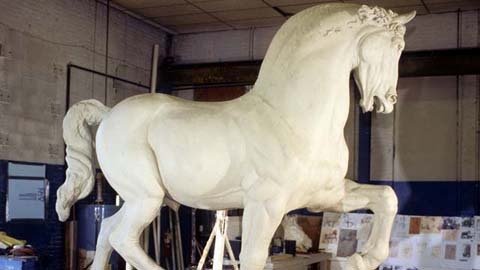 Using The Mold - A release agent should be applied to the mold before each casting. The type of release agent to use depends on the material being cast. The proper release agent for wax, liquid rubber or thermosetting materials (Smooth-On liquid plastics) is a spray release made specifically for mold making (Universal™ Mold Release). Be sure to follow directions for proper application of release agent. Prior to casting gypsum plasters, sponge the mold with a soap solution for better plaster flow and easy release. Especially for releasing concrete, Smooth-On makes an economical water based release concentrate called “IN & OUT™ II”. For releasing Polyester, a barrier coat followed by a release agent is required. Permalease™ SMC (barrier coat) followed by Permalease™ 600 release agent will yield multiple castings and prevent rapid deterioration of the mold. Permalease™ products are available from Smooth-On.